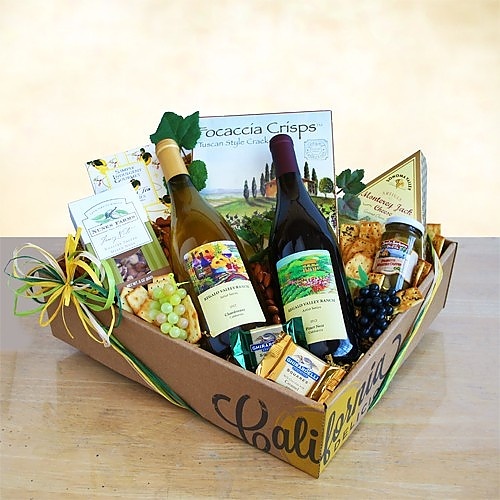 Send warm California wishes for any occasion with this fabulous signature California wine gift box filled with great wine & goodies. Send warm California wishes for any occasion with this fabulous signature California wine gift box filled with great wine & goodies. They will love the two bottles of California Regalo Valley Ranch wine a crisp 2012 Chardonnay and a 2011 hearty Cabernet Sauvignon. They will sip and savor along with crisp California focaccia chips, Monterey Jack cheese, Nunes Farms nuts.